The Pullman Hanoi recently metamorphosed into one of the city's premiere business hotels - close to corporate headquarters and government offices, an easy 10-minute drive to the charm of Old Quarter. Ideal for work meetings, equally well-suited for socialising, with all-day dining at La Cheminee restaurant and panoramic views from the upper floors. Located in the middle of Hanoi, an area bridging the Old and the New of the 1000-year city, Pullman Hanoi offers a perfect blend of business and leisure. Nearby attractions include Van Mieu -the first university of Vietnam and One Pillar Pagoda. Take a break from work andWorkout in the new Fit Lounge and Tennis course. Free shuttle bus to the old quarter. Free 'wake-up take-away' coffees for all guests who check out before 6am. Entrance 61 Giang Vo Str. Situated in the heart of the lobby, the bar is continually changing for a relaxing, convivial experience any time of day. 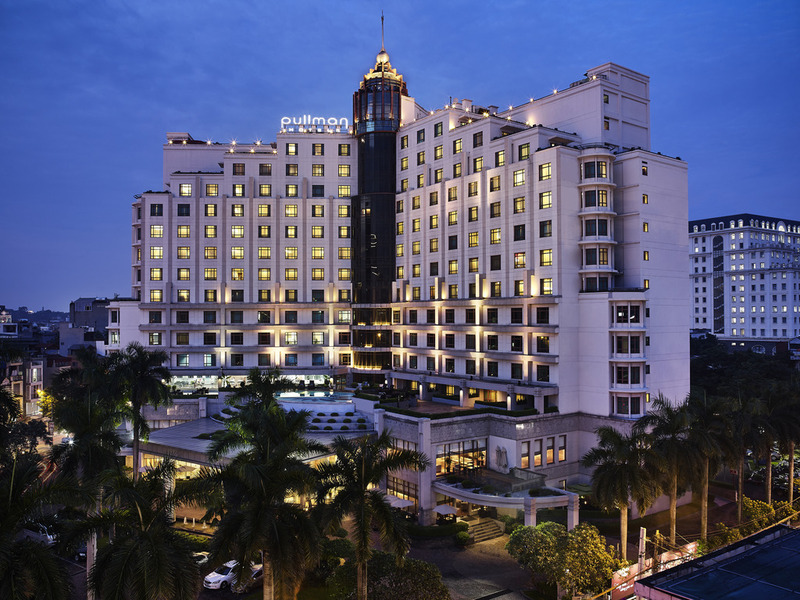 The Pullman Hanoi is very nice, staff are fantastic and we thoroughly enjoyed our stay there. The facilities are great, fitness centre and Spa very good. It’s location is very central to many things of interest. Close to the Old Quarter. Although the hotel is not situated in the Old Quarters area, facilities are okay for a respite from the daily grind. Breakfast spread was okay but an improvement on the variety of fresh fruits served during breakfast should be made. The trip's purpose was to visit the Halong Bay area ( UNESCO heritage site ) and Skull Island and savor the Hanoi local food. Although the two days tour of 12 hours each was somewhat tiring , the sites visited compensated for the travel time. The hotel hospitality and service with full care is appreciated. All of the staff we encountered were excellent in their service presentation plus their friendliness and willingness to help beyond normal expectations. In terms of hotel presentation itself, it appears to be somewhat tired. I note, however, that there are substantial works underway in the road adjacent and hope that completion will enable internal works to commence. (The pool is in need of at least cosmetic repair). I have book the room including airport pick up one week earlier. When i'm arrived in the airport, car is not available or ready until i call reception that just arrange transport, hence have to wait another 30 mins. Feel welcome on check in but room not ready and again another wait! Great hotel that went above expectations for us on our trip. A loyal customer will come back to the same hotel for the following reasoning: consistent impeccable hospitable service, a courteous team who care about their customers , really! and last but not least a great price for luxury lifestyle. Helpful staff, Clean room, Good breakfast! All of the hotel's staff are very friendly and helpful ... keep on training your staff to be as superb like this pls. - excellent service by Ms. Trang (premier floor guest relation) who assist in guiding me to the correct location/destination of a new customer in Hanoi I was supposed to meet. - overall everyone at the hotel from house-keeping to the front-desk reception was excellent and very helpful. I recently visited Hanoi to assist with the Summit between the U.S. and North Korea. My days were extremely long and I often had a few moments to grab a bite before having to go to work. The staff in the Club Lounge were so attentive and helpful. They quickly learned my routine and made sure everything was ready for me when I arrived. I have never experienced such exceptional customer service before and am so appreciative of the staff’s effort to make my stay absolutely wonderful! Very pleasant and efficient staff and good facilities. Ok Pullman hotel getting a bit dated. No atmosphere. Average breakfast. Good spa facilities though. I was booked in a smoking room even if i requested a non smoking (hotel was full but i am a Accor member) no welcome drink. Friendly staff.